The latest version of ABI’s SYSTEM 8 Ultimate software is available to download now. The version 3.10 brings a wealth of improvements that ABI customers can benefit from without having to pay anything extra to upgrade their systems. Click here to register and download the latest software. NEW AMS 3D Manual Probe Mode – Acquire signals from an IC, connector, etc using a probe and get an overall Pass or Fail. NEW AMS 1 to 1 mapping – an easier way to interface the AMS with test rigs, connectors, custom cables and more. NEW 3D/2D Masks can now be cleared for individual pins. To access it, right-click on a pin graph to clear the mask. Click in Store again to save a new mask. The AMS now supports compare tolerances down to 1%. Pulse outputs now default to +-1V. The AMS 3D V-I Tester instrument now displays live compare probes differently to make it easier to see which probes are being used. Improved accuracy of the current range displayed on the axis when small currents are used. New colour arrangement to better match the device display. NEW AMS Matrix Tester – Now shows voltage and current on the axis. NEW Open additional displays for channels 1, 2 and 3. NEW Maximum acquisition size for MIS4 is now 100 divisions and scales appropriately based on time base to maintain responsiveness but allow the user to see more data. MIS4 DMM - Removed the “under range” flag/warning. Multiple stability and performance improvements across different instruments. NEW StartInstrument and StopInstrument functions added to the Calculator / Script Editor: users are now able to add these functions to new or existing programming scripts to start and stop instruments automatically in Run mode. Modules supported are BFL, AICT, ATM and AMS. Contact ABI if you require further information. NEW Calculator layouts have been added for the user 1-4 calculators. NEW Calculator - AMS_VI3D_COMPARE_RESULT and AMS_VI3D_COMPARE_PERCENTAGE added as new functions. TFL Report - Improved template, now prints much better. Added the ability to change the report title from the instrument setup. NEW REPORT function added to the calculator. Users can now access TFL report features from programming scripts. 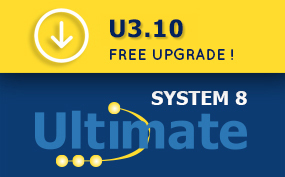 *Free SYSTEM 8 Ultimate upgrades available for SYSTEM 8 products acquired after 1st January 2010.